3 days – hundreds of vehicles, most offered at no reserve! For the last 48 years, enthusiasts from all over the world have flocked to the Barrett-Jackson collector car auctions. Widely regarded as a barometer of the collector car industry, the auctions have evolved over the years into world-class automotive lifestyle events where thousands of the world’s most sought-after, unique and valuable automobiles cross the block in front of a global audience — in person and on live national and international television. 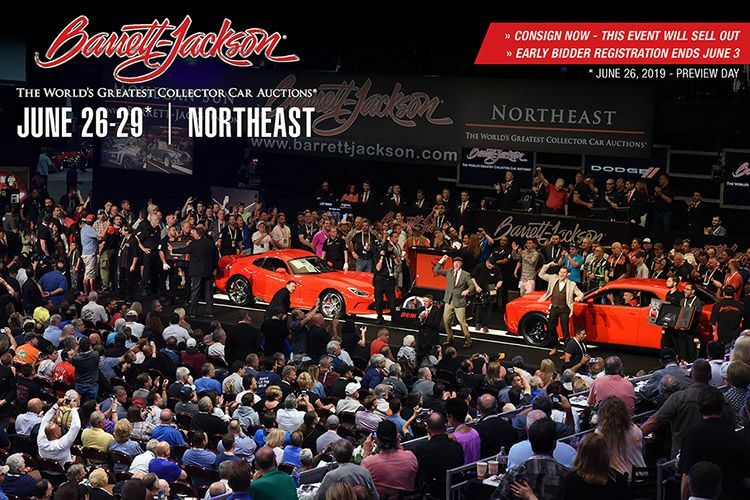 Barrett-Jackson produces The World’s Greatest Collector Car Auctions® in Scottsdale, Arizona; Palm Beach, Florida; Mohegan Sun in Connecticut and Las Vegas, Nevada. In addition to the millions watching the events via live worldwide television coverage on Discovery Channel and Velocity, over 500,000 people are in attendance at all four auctions, looking to witness auction action at its best, capture the car of their dreams, learn more about collector cars through “Behind the Hobby” symposiums, mingle with celebrities, experience heart-stopping thrill rides in the latest vehicles from America’s top automakers – or shop in the vast Exhibitor Marketplace. All buyers, sellers and spectator are welcome to attend Barrett-Jackson Northeast 2019.